Katherine House is purpose built to a high standard and offers round-the-clock care from fully qualified, experienced staff. The residents' individual needs are constantly monitored and their care is reviewed and updated on a regular basis. The welcoming staff ensure that the privacy and dignity of all residents is of the utmost importance at all times. The design of the home ensures that all areas, including the bedrooms and communal rooms have a positive impact on the lives of the residents. 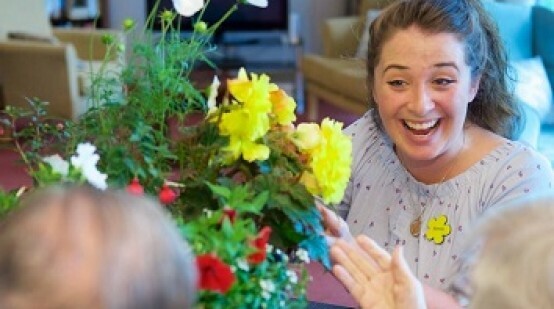 Relatives are welcomed and encouraged to spend time at Katherine House, whether that's exploring the gardens, sharing a meal in the dining room or joining in with planned events. All communication with relatives is two-way with feedback actively welcomed. We are pleased to be able to offer respite care for those with low-level needs, if a room is available. This can often be a useful introduction to future long term care, or can simply be used to offer carers a short break. Unfortunately, we cannot offer a bookable respite service. We encourage our residents to use technology to explore and relive their memories. We currently have 2 iPads, which residents and families can use to look at pictures, emails and Skype. The charity is fortunate to have its own minibus which enables occasional trips out, supported by relatives and staff. Find out more about the charity behind Katherine House. Hear from members of the Katherine House team.